Sarah O’ Kelly here with Skipper’s Review T.V and I’m here today with Petro and Brandon from EC Ruff Marine. Skipper’s Review T.V and EC Ruff Marine are going to document a series of installs, refits, lighting on boats and yachts. So if you’re a boat owner you know how many possible changes that can be made on your boat. The list just goes on and on. With Skipper’s Review T.V and EC Ruff Marine we hope to answer any questions you may have about probable changes you may make to your boat. Today we are starting off with a 100ft Ocean Alexander, starting off big! and the owner wants to get some new lighting installed. So Petro is the lighting going on the bow, the stern, the transom, where is it going? APEX LIGHTING: It’s going on the sides and the transom. 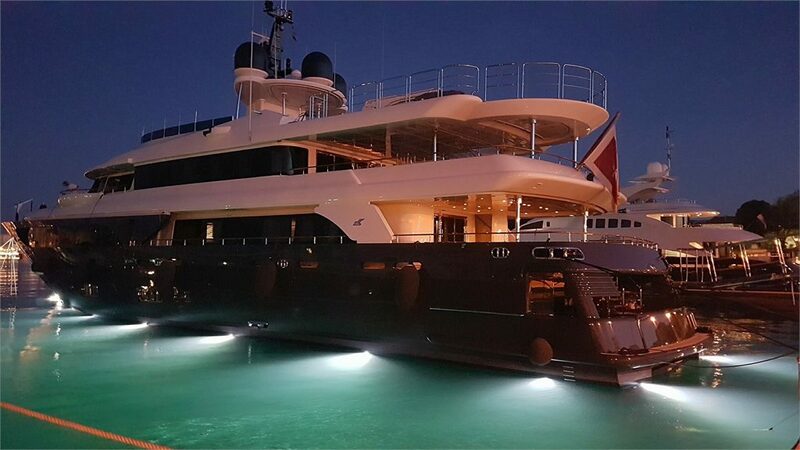 This owner came to us with this 100ft Ocean Alexander and the boat was pre-fitted from the factory with small surface mounted under-water lights that just were not that bright. We are putting something just slightly bigger. We removed four small surface lights that were probably about 3000 lumens and we are replacing with 8 dual color, these can change from white to blue, #Bluefin LED, they are called The Great white. This model and these Bluefin put out about 12,000 lumens verses the 3,000. Another advantage of these lights are if one of the lights fail, the boat would normally have to be hauled out of the water but with these lights if one fails they can just simply change it from inside the engine room. So they don’t have to haul it ever again for lights. Also in the future if they want to change the color to green or a different color they can just change the guts from inside. I will pass this off to Brandon and he will explain to you how these go on. How do you install the LED lights? EC RUFF MARINE: Now what I’m going to do is show you how we install the lights with 5200 sealant. SKIPPER’S REVIEW: If we are changing from one size light to another how difficult is that? This guy is upgrading so I presume we have to change the size of the hole where the light is going to go. 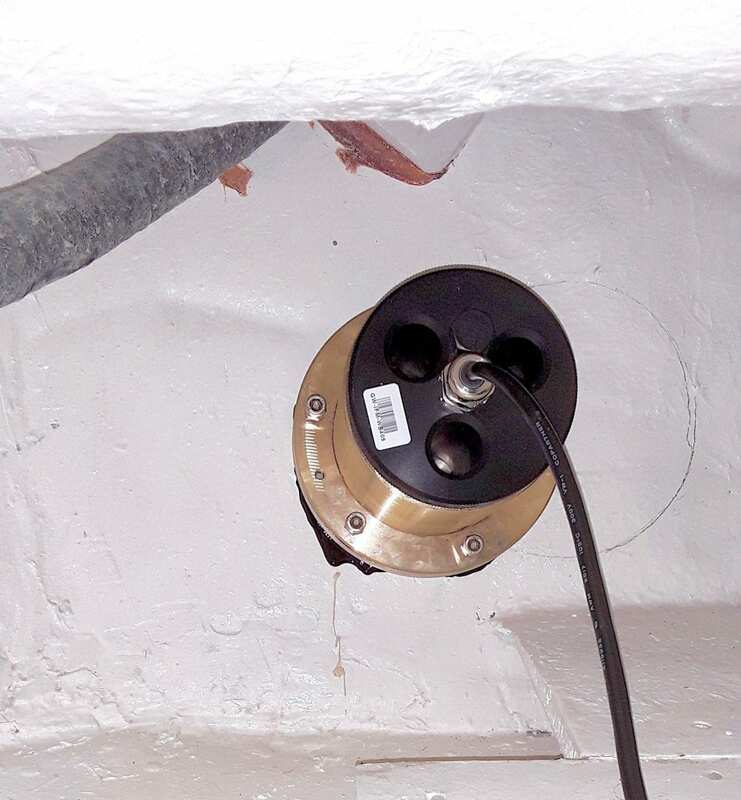 EC RUFF MARINE: We do have to change the size of the hole but usually on the surface mount there is a 1/4 inch hole and we use that as a pilot hole. Then we use a hole saw with this diameter and then we end up putting the lights back in the same area. SKIPPER’S REVIEW: Is there a possibility that you could miss read the size of the hole and we could have a little bit of a leakage? EC RUFF MARINE: It’s possible but I have been doing this for so long that I’m pretty good at it. SKIPPER’S REVIEW: Does it make a difference what the hull is made of, fiberglass, metal, wood? EC RUFF MARINE: Usually not but you want to make sure that you do bond the lights to your existing bonding system on the boat. SKIPPER’S REVIEW: We are putting these in in a 100ft yacht but say you have like a little 21 footer and you wanna light up the transom a little bit, would this size be suitable or is this kinda going over the top? EC RUFF MARINE: This would be over the top but I have seen it before where a guy with a small boat wants the best and biggest, brightest light you can put on there so it’s just a matter of how much money do you want to spend. 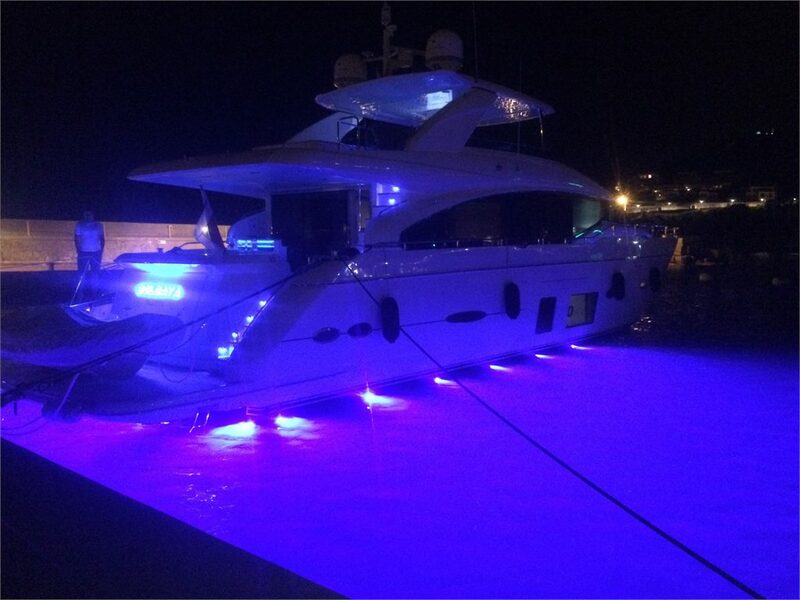 SKIPPER’S REVIEW: Why do people usually get the lighting put on their boat is it for safety, is it for decoration? EC RUFF MARINE: It’s mainly for decoration, at night you get a lot of bottom fish that come up to the light for feeding. It’s all for looks. SKIPPER’S REVIEW: Petro how much is it? APEX LIGHTING: Something like this starts about $1500 for a single color, and it goes up to a dual color, or we do have them in full color changing. So you can actually use the phone or an app to change purple streams, making strobe flashing. So, on, the prices $1500 to $2500. SKIPPER’S REVIEW: How many is this boat owner getting on his boat? APEX LIGHTING: Eight I believe. SKIPPER’S REVIEW: Is that like, three on the port and starboard then a couple on the transom? APEX LIGHTING: There are four on the transom and then there is going to be one or two on each side. SKIPPER’S REVIEW: Brandon Is going to show us how it gets installed. So tell us what are you doing Brandon? EC RUFF MARINE: Right now i’m putting 5200 on the back end of the light so when we tighten it down it will be sealed and there will not be any water leaks. SKIPPER’S REVIEW: So you say 5200, what is that? EC RUFF MARINE: It’s a below the water line sealant used commonly in the marine industry. Tito with EC Ruff Marine. SKIPPER’S REVIEW: So now it’s the hand off I guess. So where are you going Tito? EC RUFF MARINE: So, we are going to start this one on the starboard side, the hole has already been pre cut before, due to Brandon. Brandon already had it cut and measured and everything. Now he is putting 5200 on the inside to also have extra sealing for protection. So, you always like to make sure that when you do this, you face, each one, the right way. So, There’ll be no confusion. SKIPPER’S REVIEW: So, what do you mean by face each one the right way. EC RUFF MARINE: I will show you right now. So with this light we know there is something in our way so we are going to have to remove it. So there will be no problem putting this light in for future reference. SKIPPER’S REVIEW: So what was in your way? Life? EC RUFF MARINE: You got a piece of rubber like this. SKIPPER’S REVIEW: So he has to cut a piece of the hole away, is that what you mean by cut a piece away? EC RUFF MARINE: Not the hole, nothing to do with the hole. He is cutting away the extra plastic just so we can get a better position of the light, so nothing will be in the way. Anybody who don’t deal with boats you would never really want to do this if you do not have experience. Right beneath the plastic is the fiberglass of the boat and you really never know the depth that you are going, if you do not have experience in this. But Brandon has over ten years of experience, that’s why he is one of the best. As he tightens it you will see that the 5200 seeps out the sides. SKIPPER’S REVIEW: Sarah O’ Kelly here with Skipper’s Review T.V with EC Ruff Marine.